There are free opensource shopping carts available that can handle anything from a small site to a very large project. NopCommerce, Magento, Woo Commerce are just a few examples of software that can be used based on your project. Many shopping carts support eBay, Google, and Amazon stores with functions that automatically update the stores when your site is updated or you can easily post to stores from features in their admins. Our shopping cart gives you the ability to calculate shipping charges from UPS, USPS, and FedEx. So that your website visitors can always get minimum shipping rates comparatively. Shopping carts support online payments. With online payments, you can select AUTHORIZE.NET, PAYPAL STANDARD, PAYPAL PRO and many more as your payment processor. SEO is an important part of any eCommerce software. Software needs to dynamically generate SEO friendly URLs that include the title of your product, keywords, and description of each individual page and product page on the site. 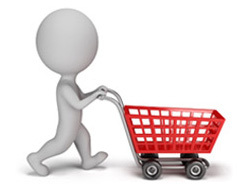 There are a large number of online stores that are believed to get you selling in a small amount of time. Like any software solution, there are advantages and disadvantages to them. Many of our clients have used these services so we have developed a lot of expertise fixing updating and modernizing their sites. Bigcommerce, Shopify, 3dcart, and Magento are just a few of these applications.